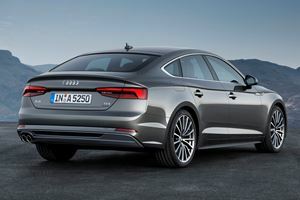 The newly redesigned Audi A5 is available with a 252 hp 2.0-liter turbocharged engine, transmission options are either a 6-speed manual or 7-speed dual clutch automatic with Quattro all-wheel drive a standard fitment. All trim levels get leather, power front seats and 10-speaker audio systems while the top Prestige Trim offers an 8.3-inch infotainment display and an exclusive driver assistance package which amongst other items adds active lane assist and adaptive cruise control to the already comprehensive standard safety systems. From the outside the Audi A5 may look like it has been subject to a subtle refresh for 2018 but beneath that elegant exterior is a fully redesigned luxury sport coupe. A comprehensive equipment list now includes advances such as the virtual cockpit and the very latest safety systems. The 2018 Audi A5 offers a completely redesigned cabin with top-class fit and finish as well as a high level of luxury and quality of materials even in base trim. The front row of seats offers plenty of space however the coupe body style limits accessibility to the rear and the sloping rear windscreen further limits headroom for taller passengers.The cargo area is generous enough and the folding rear seats add a lot more space if required. The A5 is a composed and confidence inspiring vehicle, the standard all-wheel drive system and redesigned suspension make for a surefooted car in most road conditions. A selection of driving modes lets you set the parameters for the various drivetrain components, an individual setting allows for further customization too. Feedback from the steering is limited and the car still resorts to mild understeer if pushed beyond the limits of grip but driven within its ample capabilities few shoppers would walk away unimpressed. Despite large 18-inch wheels being fitted as standard the ride is absorbent on all but the roughest of surfaces and there is the option of an adaptive suspension on the top Prestige trim that helps keep the ride comfortable even if you go for the optional 19 or 20-inch wheels. An available S Line Sport Package includes a sport suspension setup too. 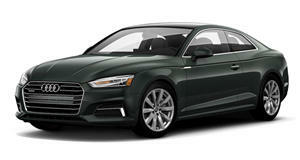 The new Audi A5 is equipped with a 252 horsepower 2.0-liter turbocharged engine. It provides a strong 273 lb-ft of torque and can be paired with either a 6-speed manual transmission or a 7-speed dual clutch automatic, Quattro all-wheel drive is standard. The benchmark 0-60 mph time is dispatched in either 5.6-seconds with the dual clutch transmission or a tenth slower if you opt for the manual. 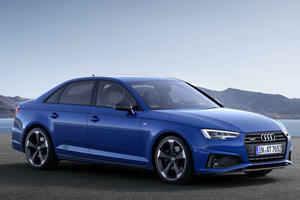 Whichever one you choose the new A5 is a solid performer and easily matches its competitors in the performance stakes. The Audi A5 is very well-equipped and even the base Premium trim level includes a whole host of desirable convenience and safety features. 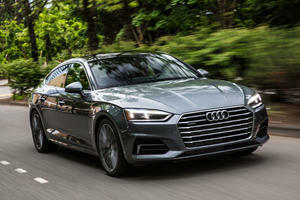 18-inch alloy wheels, Audi pre sense safety systems, Apple Car Play, Android Auto and Bluetooth integration, rearview camera with 7.0-inch MMI infotainment system and 2 USB ports, LED daytime running lights, panoramic sunroof, three-zone climate control, leather upholstery and automatic wipers and headlights are just a sampling of what comes as standard. Move up to the Premium Plus Trim level and in addition to the above you also get full LED headlights, keyless, entry, hands-free tailgate and heated front seats with driver memory function. Safety systems are also expanded with rear cross traffic alert and vehicle exit assist. The top Prestige Trim level further adds the Audi Virtual Cockpit, head-up display, B&O 19-speaker audio system, MMI navigation with handwriting recognition and an advanced parking system with top view camera. Adaptive suspension and a Driver Assistance Package which includes adaptive cruise control, traffic sign recognition and active lane assist is available only on this trim. A Navigation Package which includes the Audi virtual cockpit and 8.3-inch MMI screen as well as an S Line Sport Package which offers sport suspension, seats and visual updates are also available. Certain items can be ordered individually too such as larger 19-inch alloys a navigation system and a vast range of interior colors, detail inlays and exterior paint colors are available too. The redesigned 2018 Audi A5 raises the game once again in the luxury sport coupe class. The evolutionary exterior design houses a comprehensive specification list including advanced convenience and safety systems. Sure-footed grip from the standard Quattro system and a top-class interior make for a very accomplished vehicle. This could change how we think of car ownership.